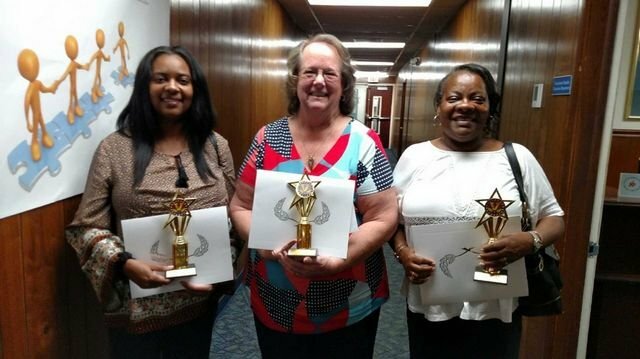 On Tuesday, April 25, the Gadsden County School Board recognized three outstanding volunteers who graciously donate their time in our school. Mrs. Shone Mathews volunteered full school days in our second and fourth grade classrooms, while Mrs. Patsy Willis volunteered three or four days per week in our third grade classrooms. Mrs. Willis also helps with our school programs and recreational activities. And Mrs.Eleanor McNealy volunteered in Ms. Bates-Jackson's first grade class five days per week from August through December. These ladies, in addition to all the other people who volunteer here, are a large part of what makes Greensboro Elementary a truly unique community school. And we can't thank them enough!